Good customer service Is essential to the success of your business. Statistics show that there is a 60 to 70% probability of selling to an existing customer versus a five to 20% probability of making a sale to a new customer (Marketing Metrics) and gaining new customers is seven times as expensive to the business as retaining existing ones (Parature). Over half of consumers are willing to pay more for better customer service (Defaqto Research). Successful businesses know how to build loyalty by establishing relationships with their customers, identifying their wants and needs and providing the highest level of customer service. According to a 2011 American Express Survey, 78% of consumers have not proceeded with a purchase because of poor customer service. It takes 12 positive customer service experiences to make up for one negative one. After a poor customer experience, 89% of dissatisfied customers make their next purchase from a competitor (Harris Interactive). U.S. businesses lose an estimated $83 billion annually due to poor customer service (Genesys, NewVoice Media). Customers are twice as likely to talk to friends and family about poor customer service experiences than they are to discuss positive ones (American Express). One way to get regular feedback about customer satisfaction with your business is to use customer surveys. 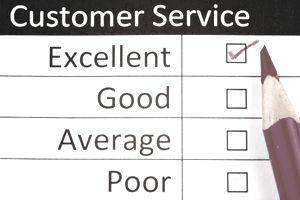 A survey can give you an appropriate measure of customer satisfaction (or dissatisfaction) with your business products or services. The results of a survey can identify ways in which you can improve customer experience. It can pinpoint areas that need improvement (such as staff interaction with customers), or ways that you can more effectively meet the customers' needs adding additional products or services. Customer surveys do not have to be expensive. Adding a survey to your website or business Facebook page is a simple, inexpensive process. Surveys can also be by phone, email or collected on slips of paper in your place of business. Businesses that use satisfaction surveys are generally looked upon more favorably by customers - especially if you take the time to respond to those who have expressed dissatisfaction. This short customer service survey questionnaire is designed to provide insight into the transaction between your business's staff and your customers. It's a general customer service survey example that you can use to get feedback about face-to-face customer service interactions, adapt it to your needs by adding other questions specific to your company as needed. Please take a few minutes to complete the following customer service questionnaire. Your comments will enable us to see how we're doing overall and find out how we can improve. Staff was friendly and cheerful throughout. Staff showed knowledge of the products or services. What did you like best about our customer service? Is there a staff person you would like to commend? Thank you for taking the time to complete our customer service survey. Negative survey responses should be addressed as soon as possible. Your chances of retaining a disgruntled customer are much higher if you respond immediately to their concerns. Keep in mind that some individual customers may be prone to leaving unreasonably negative feedback and will be dissatisfied no matter how you respond, so know when to move on. It is more important to identify common complaints and address the underlying issues accordingly. If possible, contact disgruntled responders directly and discuss the survey responses. Listen carefully, apologize as needed and accept any criticism without becoming defensive or angry. Tell the respondents that you will work to address the issues and will contact them again at a later date to see if the changes have met their expectations. Responding to customer complaints shows that you care about their concerns and want to keep their business.